Fr. Larry is originally from Olean, New York and met the friars through St. Bonaventure University. 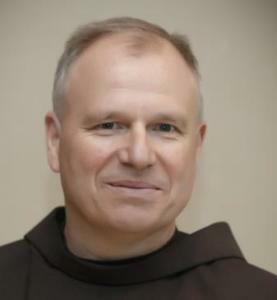 He was professed as a friar in 1991 and ordained in 1996. Upon ordination he was assigned to St. Anthony Shrine in Boston to work the schedule of masses and confessions and served as the business and operations manager. Staying in Boston, he began doctoral studies while working as a Doctoral Fellow in the Lynch School of Education at Boston College. He worked for a year as a program manager at the University of Notre Dame, from where he received an MSA degree in 1996. He has also served as a friar in residence at Holy Name College in Silver Spring, MD and at Siena College outside Albany, NY. Fr. Larry is the oldest of five children and enjoys cheering for college athletics, especially basketball and is a Buffalo Bills and a Boston Red Sox fan.